View More In Storage Sheds. Build a storage unit right in your backyard with this Hopkins Peak Roof Shed Kit. Perfect for storing your lawn equipment, sports gear, and patio furniture, this shed is versatile and durable. This storage shed kit is easy to assemble, requires no angle cuts and features only straight 90-degree cuts. It features an appealing peak roof design that also helps water and snow slough off, preventing structural mishaps. 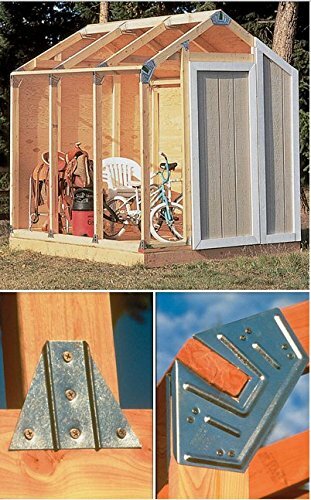 This do-it-yourself shed kit comes with easy assembly instructions, a materials cut list, and 39 brackets to complete the structure. If you've ever wanted to work on a home-improvement project but aren't sure how to start, this kit will show you the way. More experienced renovators will also appreciate the straightforward approach this kit provides. If you have any questions about this product by Hopkins, contact us by completing and submitting the form below. If you are looking for a specif part number, please include it with your message.